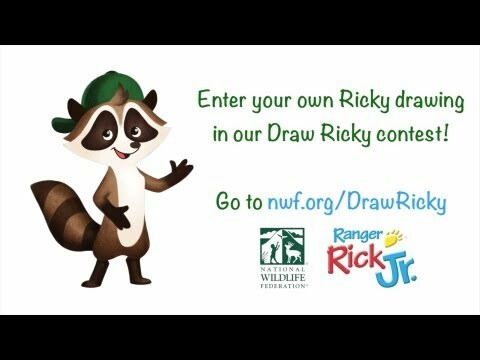 Ranger Rick Jr. magazine’s “Draw Ricky” contest is underway, and we’ve already received a TON of great drawings of Ricky Raccoon, the magazine’s mascot. Haven’t entered yet? Head to our website by June 30 to submit your child’s best Ricky drawing! Winners receive a Ranger Rick Jr. hat and get their drawing featured in the October issue of the magazine. Follow us on Facebook, Pinterest and Tumblr to get updates on the contest and see some of our favorite submissions! Seeing all these renditions of Ricky inspired us to talk to the authority on all things Ricky Raccoon: Christian Slade, the artist who helped originate the character and has illustrated the magazine’s “Ricky and Pals” stories for the past five years. “Ricky and Pals” follow the adventures of Ricky Raccoon and his animal friends as they explore the outdoors in Deep Green Wood, their forest home. Christian feels a special attachment to the character that he says is “like one of his kids.” He describes Ricky as a loyal friend who’s “an explorer, first and foremost. He’s an adventurer, and he loves nature.” Ricky loves to bring back all sorts of nature treasures to his tree house, much like Christian fills his art studio with his many collections. According to Christian, Ricky’s face and hands are the most important—and the most difficult—to get right. He draws Ricky’s expression first, and sometimes makes faces in the mirror above his desk to help him capture it. Christian also modeled many of Ricky’s gestures and mannerisms off of his 5-year-old twins Nate and Kate. His initial sketches are very loose, “like a pile of spaghetti, but the essence is there.” Then he goes back and tightens it up to make sure Ricky looks exactly like the raccoon readers know and love. In “Ricky and Pals,” the environment is just as much of a character as Ricky or Bizzie Beaver. Christian says it’s probably the greatest character because it provides the setting for the characters to explore. The artist loves to immerse himself in nature while vacationing in the mountains, soaking up details of the animals and trees that he can incorporate into Ricky’s world. Need some inspiration for your own Ricky drawing? Watch the video to see Christian drawing in his studio and get his tips on how to draw your favorite raccoon. It’s a fun, behind-the-scenes peek at the world of Ricky and Ranger Rick Jr.! Kids have until June 30, 2013 to submit their entry (online or by mail) to the Draw Ricky Contest. Winners receive a Ranger Rick Jr. hat and get their drawing featured in the October issue of the magazine.